United Energy Plus Terminals (UEPT) delivers consistent, high-quality products along with outstanding customer service. We pride ourselves in supporting and focusing on the business needs of each and every customer. As we continue to grow, we thank our loyal existing customer base for their business and welcome new customers. Call or email us today and let us know how we can better supply your petroleum product needs! Whether you are a small family owned heating oil distributor or a large national marketer; UEPT will provide you with the customer care you deserve and expect. 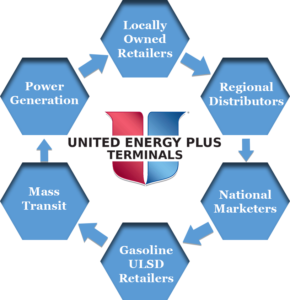 United Energy Plus Terminals (UEPT) provides the petroleum products needed by independent gasoline, diesel and heating oil distributors. We meet the needs of all independent distributors; small companies as well as large companies. We customize our services directly to you. Let us know how we can help your business. United Energy Plus Terminals (UEPT) provides petroleum products at a majority of the major terminals in the Mid-Atlantic region. Our terminal locations (24 in total) provide you easy access to competitively priced product with favorable credit terms. Also, if you need us to service you at another location, we will be glad to review those opportunities with you.